One of the most extensive provinces in Tuscany is Grosseto, but in spite of this the Tuscan apartments for rent in this area are just a small selection of the great amount of accommodations you can find in the whole region. The holiday homes in Maremma, the area covered by the province of Grosseto, are located in medieval villages or in recently renovated farmhouses, but usually far from the madding crowd as the area is not highly populated. Also the coastal area, once marshland and now well known for its beautiful beaches, is characterized by small quaint villages, among which one of the oldest is Castiglione della Pescaia. Grosseto, the main town, lies in the south west, in the area known as the Alta Maremma (Upper Maremma). It is first mentioned in the 9th century as the fief of a noble family, the Aldobrandeschi. It grew in importance over the years with the decline of the Etruscan town of Rusellæ (for accommodations in Maremma, near Roselle, see our ref 83-84) , whose ruins can still be admired at about five miles from the town. Under the sway of the Medici Family the construction of a line of defensive walls, still extant today, was begun in 1574 by Francesco I, replacing older ones dating back to the 12th century. Francesco meant to turn Grosseto into a fortress in order to protect his southern borders. The walls, designed by Baldassarre Lanci, were completed 19 years later, under Grand Duke Ferdinand I. The walls are now used as a public park and walking area. The Medici also played a basic role in the reclamation of what used to be an unhealthy marshland, which was to be finally completed in the post-war years. A traditional Tuscan song mentions “Maremma amara” (bitter Maremma) as it was plagued by marsh fever. It is even mentioned by Dante in his Divine Comedy, in the 13th Canto of the Inferno, where he writes:(the wild beasts, that hate the cultivated fields between Cecina and Corneto, have lairs less harsh and tangled). Today the area has totally changed owing to the reclamation and protection of the natural environment. Mountains, rivers, pastures, beaches and marshes, stretching out along nearly 10,000 hectares on the coast between Principina and Talamone, make up of the Natural Park of Maremma, otherwise known as Parco dell'Uccellina after the name of the mounts dominating the site. The park stretches inland from the banks of the mouth of the river Ombrone. It seems impossible that this land should be the “bitter Maremma” of the old folk songs, evoking a world of toil and sufferings in a harsh, swampy background overrun by highwaymen and marsh fever. “L’uccello che ci va perde le penne” (the bird who flies there is going to die) the seasonal farm labourers used to sing while harvesting. Now birds do migrate there and one can observe various protected species such as herons, coots, hoopoes, kingfishers. Moreover one can easily come across wild boars, deer, roes, badgers, foxes or wild horses and long-horned Maremmana cattle grazing freely. They live quite undisturbed among myrtle bushes and Saracen guard towers. This is a unique place which has conserved its beauty unspoilt and prompts tours to lovers of open-air life. This wildest corner of Tuscany can be discovered on horseback, on mountain-bike or simply driving along the roads linking quaint villages up. Worth a visit are: Saturnia, whose sulphurous waters were already known to the Romans; Manciano, characterized by a beautiful fortress built by the Sienese people in the 15th century; Pitigliano, an Etruscan and Roman village built on a tuff spur; Sovana and its Etruscan necropolis (for our apartments for rent in Maremma, pls visit our web site section) . Here one can breathe the Etrurian past, smell the tuff, taste the great wines, experience the excellent restaurants and charming hotels. These holiday apartments on the Etruscan Coast in Tuscany, are located between Follonica and Punta Ala, only a few kilometres from the medieval hamlet of Scarlino. There are 27 self catering apartments for rent, each very comfortable and fully equipped with air conditioners. Guests have access to the swimming pools (one for children), open from middle of May to October 15th, provided with deckchairs and beach umbrellas. Free internet wi fi at the reception; fees applied for wi fi access into the apartment. At only 500 metres from sandy beaches, and 300 mt from the new harbour of Scarlino Marina, these Tuscan holiday accommodations are a perfect location for the sea lover but also the ideal starting point for visiting the beautiful hamlets of Maremma such as the tuff town of Pitigliano, the Etruscan Sovana, Baratti and Populonia. Natural attractions, instead, are the Uccellina Park, which covers the coastal area, the promontory of Monte Argentario, and other renowned and enchanting beaches such as Cala Violina, Cala Martina and the ancient seaside town of Castiglione della Pescaia. Near the holiday residence sport lovers can also find tennis courts, golf courses, horseback riding schools, windsurf and kitesurfing rental points. These holiday accommodations in Maremma are in a farmhouse which dates back to 1769 and maintains the typical old style thanks to a restoration which has respected the original architecture. 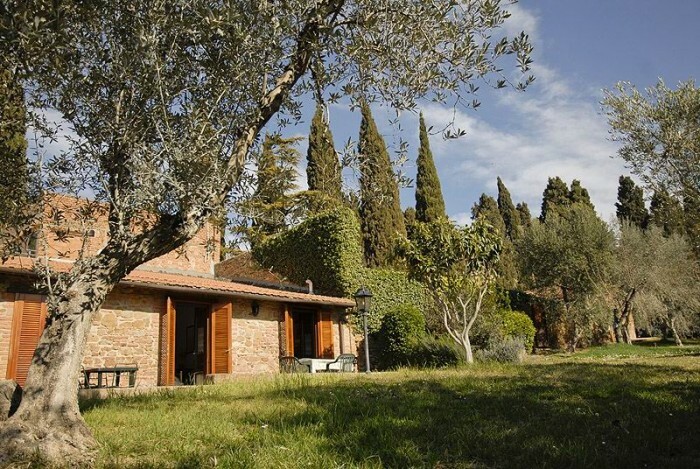 Surrounded by its 22 hectares of olive groves, the Bed and Breakfast is located on a “Poggio”, Tuscan for knoll, which dominates the valley of the Ombrone river. A typical Tuscan road lined by cypresses leads to the main villa and to the large garden. The holiday accommodations are in and around the main villa. The farm produces an excellent olive oil, which one can taste at any time, as well as honey, jams, fruit and vegetables all available to guests on request. These accommodations in Tuscany are located in the heart of Maremma, near Saturnia, surrounded by hills of olive groves and vineyards. 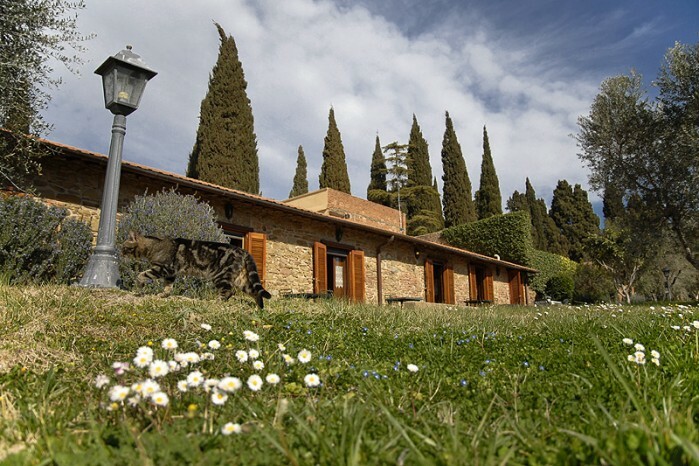 Renovated, following the classical Tuscan architectural style, with environmentally-friendly materials, the country house and its outhouse have 6 large rooms of varying shape and sizes. Guests have access to shared rooms for reading and relax as well as a panoramic room suitable for meetings and workshops. Surrounded by a beautiful garden with lawns, roses and cypresses the Bed and Breakfast overlooks the unspoilt Tuscan hills; ideal for a relaxing holiday. These Maremma accommodations are near the thermal baths of Saturnia (at 13 km) and the medieval villages of Manciano and Montemerano, as well as Pitigliano and Sorano, other two pearls of the area. Also a few minutes away from Capalbio, Sovana and the beaches of Mount Argentario. This modern and comfortable holiday accommodation in Tuscany is located in the medieval hamlet of Montemerano, at just 4 km from the famous spa town of Saturnia, in the southeast of the region. 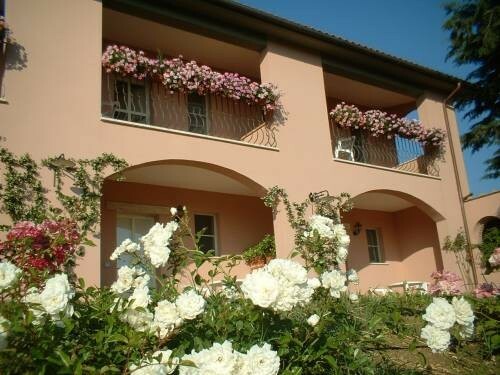 Surrounded by olive groves and the typical Maremma countryside, this holiday hotel for rent consists of only 6 bedrooms plus a suite, ideal for a relaxing and comfortable vacation far from the madding crowd. The rooms are very large and tastefully furnished and decorated with lovely frescoes. They are all provided with internet connection, safe and air conditioning. The rooms are either on the ground floor facing the garden with private terrace or on the first floor with balcony, where one can enjoy the beautiful sunset on Maremma. Nearby there is a very good restaurant where to enjoy the excellent Tuscan cooking. 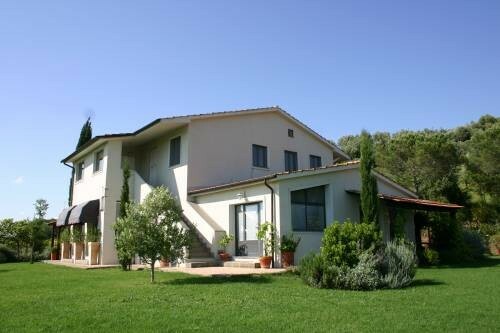 This beautiful holiday home in Maremma is located on a hill, from which the name “Poggio”, and dominates the valley of the Ombrone River at 10 km from Grosseto and nearly 20 km from the untainted seaside, typical of this area. The estate still preserves the typical characteristics of an 18th century Maremma farm: a suggestive cypress lined drive leads to the main villa and a large garden. Gathered around are the farmhouses and outbuildings as well as 22 hectares of olive groves. The holiday accommodations are located in and around the main villa and have been completely renovated in respect of the original architecture. The farm estate produces an excellent olive oil, which one may taste, as well as honey, jam, fruit and vegetables, available to guests. Pets accepted. In the property there is a restaurant for both internal/external customers (also open sometimes for weddings or ceremonies). At guest's disposal a breakfast room, a fantastic swimming pool (12x8m, open ca. middle May-Sept) set in the garden and surrounded by olive trees, internet wi fi connection at the reception, washing machine, bicycles (on req). 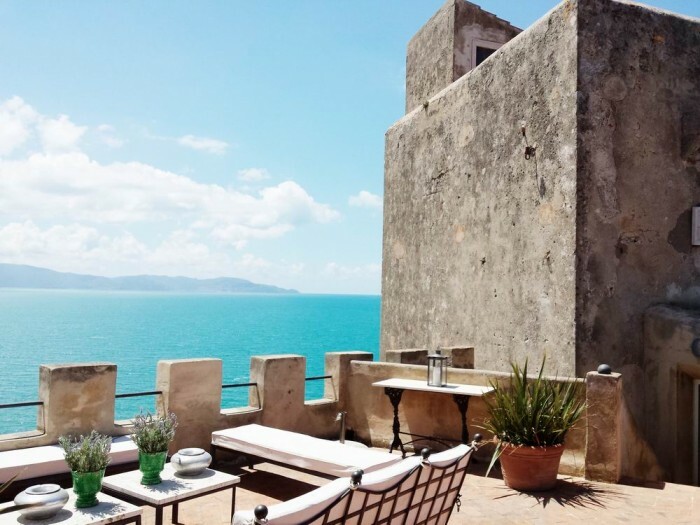 This stunning and elegant villa, originally a medieval watchtower, is located in one of the most striking corners of Tuscany, the Maremma coast, at just 2,5 km from the village of Fonteblanda and its shops and restaurants (26 km from Grosseto and Porto Santo Stefano; 150 from Roma airport). The tower has been fully restored and spectacular panoramas can be enjoyed from its terraces, perfect for enjoying a lovely dinner or barbecue or even just a glass of wine while admiring the sunset over the sea, and from the swimming pool (6x4 m, open June-Sept) below. A pathway leads down to the sea shore and the villa’s private sun deck. This wonderful property is in such a romantically beautiful position that a 007 movie, Quantum of Solace, was filmed here. The views of the Tuscan coastline are absolutely superb, as is the scenery all around, with the clear blue sea and azure skies contrasting perfectly with lush green countryside, and lovely harbours, and fishing villages dotting the landscape. Access to the villa through a private road, with a spectacular view. The accommodation, 330sqm + annex, can host up to 12 people and is on three floors. This incredibly stunning luxury villa is located in the uncontaminated region of Maremma, at 6 km from the seaside resort of Albinia. The villa is a perfect combination of tasteful antique furnishings and modern technology, where guests can experience a vacation within a cosy environment in which, however, every detail has been carefully studied. It is 800 sq m and can comfortably accommodate 14 adults in 7 double bedrooms plus 6 children (3 sofa beds for children 4-16 yrs, of which one is in one of the bedrooms and two in the living rooms; 3 baby beds for children 0-3 yrs; also a cradle for babies under 6 months). The villa is surrounded by over 2 hectares of Italian gardens, including a sunbathing area and a swimming pool (15x5 m, open May-Oct.). 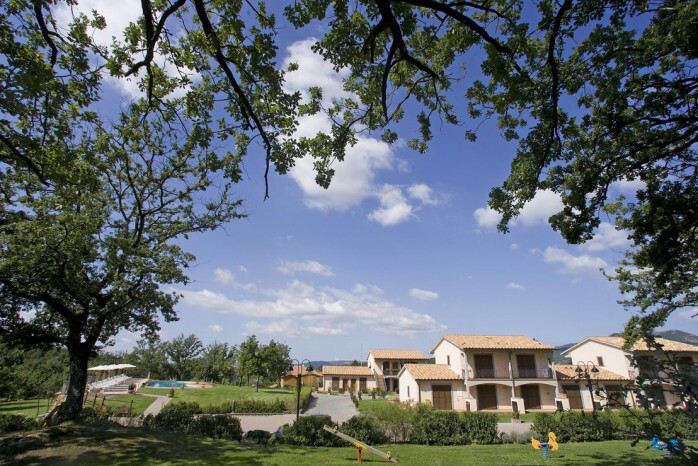 These beautiful rental apartments in Tuscany are located in the ancient medieval hill town of Sorano, in Upper Maremma, right in the Archaeological Tuff Park. The accommodations are 24 self catering apartments, recently built and comfortably and elegantly furnished, in two terraced houses, each with an independent entrance. The ground floor apartments have a private garden, while the ones on the first floor have a terrace with a panoramic view. Each holiday accommodation has a living room with divan bed, fully equipped kitchenette with dishwasher, bathroom with shower and double bedroom. The flats have Sat-TV, telephone, internet and heat pumps. Access to the accommodations by keycard. The residence is surrounded by 2 hectares of park covered in oak groves. Guests have access to a well-being centre, Turkish bath and Jacuzzi, massage parlour with chromo therapy, a large swimming pool (20x8m), a children swimming pool as well as a children play area, a barbecue, an inn with a view on the park, where we can provide breakfast (to be required by booking), a typical tuff cellar and an attended car park for 80 cars. Pets welcome.